My publisher, Momentum, plan to serialise it as they did with my first two books, and it will also be released as an Omnibus (whole novel) with the episodes recombined for those who prefer to read it all in one go. If you pop over to my author page on Facebook here, you’ll find plenty of inspiration pics I posted as I was working on this novel in the first half of 2015. 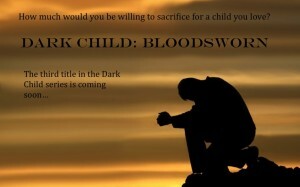 Keep an eye out for teasers from Bloodsworn that I’ll be posting on Facebook too as the release date gets closer. Or just when I can’t bear the suspense any more. IT’S KILLING ME! what happens to Alek? When is the next set of books coming out? From everything I’ve read they will be knock outs! Can’t wait, but will wait patiently for them. Good luck and blessed be! I know I’ve replied to your email but apologies for not seeing this comment sooner. Thank you so much for your patience and I hope you love the next book – in progress now! Hi Adina, assuming Bloodsworn 6 is the next book and this is what you are working on now? There won’t be a ‘Bloodsworn 6’ as that novel is completed (5 episodes, as well as an Omnibus version). The next release in the Dark Child world will be a novella, followed by more full-length novels which introduce new characters as well as referencing characters and events you have already read about. Hope that makes things clearer!